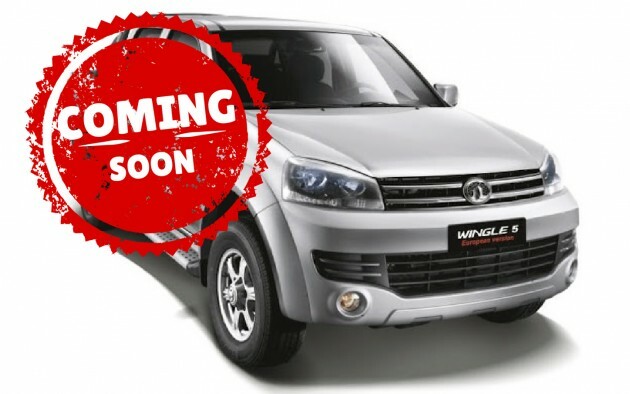 The facelifted Great Wall Wingle 5 has been announced by Great Wall Motors Malaysia (GWMM) on its Facebook page. The post says the refreshed pick-up truck will arrive in the fourth quarter this year, and will offer an auto gearbox (for the first time). The vehicle has been on sale in China as the Wingle 5 European Edition since July 2013, and is indeed an update of the Mk5 Golf-faced Wingle 5, which launched in Malaysia in July 2011, being assembled at local distributor Green Oranges’ plant in Gurun, Kedah. On this facelift, the indicators should have moved to the wing mirrors, while minor changes are expected inside, including better trim materials and possibly, auto air-con. The Wingle 5 European Edition is powered by 2.4 litre petrol, 2.0 litre turbodiesel and 2.8 litre turbodiesel engines in the Middle Kingdom – will we get any of these, or will we stick to the 107 hp/300 Nm 2.5 litre turbodiesel we’re familiar with? In response to a query on Facebook, GWMM also said that there will be a single-cab variant with a manual gearbox. We’re expecting RWD and 4WD versions as before. This vehicle is not to be confused with the Auto Shanghai 2013-debuting Wingle 6, which, although based on the same underpinnings, is positioned as a more upmarket Wingle variant in China, with a markedly more sophisticated interior. I have fond memories following a Wingle on the highway recenty. The road was congested and was following one on the middle lane in the NKVE, I just came out of an exit and was stuck on the middle lane, trying to get to the right lane, and I can’t help notice the Wingles cargo lid and bar, vibrating violently in the wind. All my effort was to get to thr right lane in fear that the lid may just fly out and…..well you should know what happens next. The only thing is, the fit and finish is a bit questionable. It is important to get it right the first time, or they’d be stuck with that stigma. Just look at Proton against Perodua. Yes Proton has improved with better quality, but the perception of the back shaking Sagas still remain. I remembered sitting in someones Saga FL. I have to say as far as NVH is concearn, it is respectable compared to the terrible noise-protection in the H. City, and the nearly intolerble ones in the P.Alza. But the car ceiling was leaking, he ask me to hole the bucket….yea. Not to mention my mom’s friends who got herself a Saga just before CNY and had to drive all the way to ipoh right on the next day……well the engine died on her near Slim River if I recalled, but it didn’t get to Ipoh. I’m open for other brands than Nissan, Toyota, Mitsubishi or Mazda. How is this car? For those who cannot afford the real Isuzu d-max…. i hope to hav auto version. n where is the motor home w auto ? 107hp/300 torque is reasonable and more suitable for a pickup that supposed to carry heavy loads and go off road, unlike some brand on our road with higher hp which i witnessed was tailgating a golf gti. looks like not bad for the price range, good luck and hope will get good market. I see nothing wrong with the car provided a good after sales service and spare parts availability. All car will face depreciation over the time. Even the top notch Toyota Hilux. Only thing is, how much you willing to depreciate. LOL… VOLKSWAGEN, when u gonna sue this company for that face? Whenever I read Wingle, it reminds me of that “wiggle wiggle wiggle” song. i am seeing more and more of the wingle everyday and i am not from big city.guess some do see the value or dont mind the country of origin. guess the aftersale support is well setup and the buyer have confident in them.engine is source from a reputable make so no issue there. its a simple truck with not much item that can fail.just like a basic car,they are so basic that not much thing can fail. Poor air conditioning system. That’s the main problem. Previous Post: AD: Get up to 1.68% financing when you purchase a Land Rover or Range Rover at One Utama or at the SCORE Expo from today till June 1!